You are currently browsing the Archaeofacts.com archives of Musings for the day Wednesday, July 11th, 2018. I laid low today, hoping to throw off this crud (no fever cold) I’ve been fighting off for days. 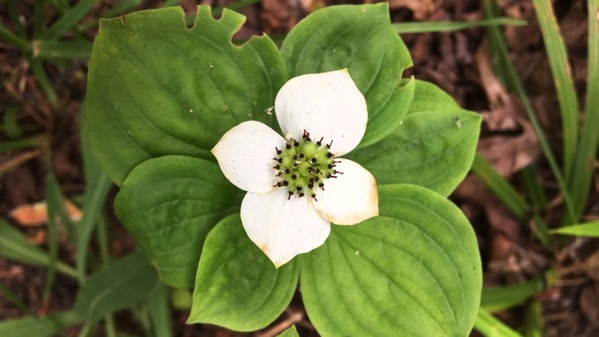 I would have been happier feeling better and rambling in the woods finding wildflowers like this bunchberry (Cornus canadensis, an important forage plant for herbivores in some ecosystems) I spotted the other day. Here’s hoping the cough-sniff-arrgh lifts tomorrow; I’m done with it. Posted in floral, personal | Comments Off on Shortest Cornus?